The Rigger doesn't believe in risking his life from the seat of a stock-class anything and is always adding, tweaking, and fine-tuning his vehicle to achieve the highest performance. 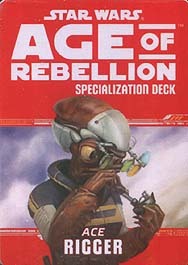 This deck requires the Age of Rebellion Core Rulebook and Stay on Target. It includes cards for all 20 talents available in the Rigger specialization.